Video clip synopsis – Donald Bradman’s bats are a reminder of how this cricket legend played himself into the record books, earning the status of Australian icon. Broadband MP4 bradmans_bb.mp4 (17.4MB), suitable for iPods and computer downloads. 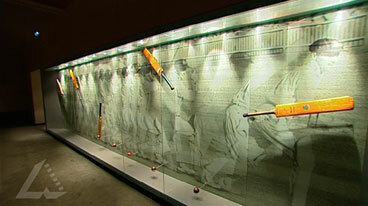 Bradman’s Bats is an episode of the series National Treasures produced in 2004. Donald Bradman’s status as an Australian icon is without question. But can just one of the bats he used to enter the record books sum up his unparalleled cricketing career? Warren Brown pulls on the gloves and picks up the willow at the State Library of South Australia for his choice among the treasured Bradman bats on display in the Adelaide collection. Historical knowledge and understanding — Students evaluate the contribution of significant Australians to Australia’s development. Historical reasoning and interpretation — students frame research questions and locate relevant resources, including contemporary media and online resources. They identify, comprehend and evaluate a range of primary and secondary sources, including visual sources and use historical conventions such as footnotes and bibliographies to document sources. They critically evaluate sources of evidence for context, information, reliability, completeness, objectivity and bias. They recognise that in history there are multiple perspectives and partial explanations. They use appropriate historical language and concepts in historical explanations. They use evidence to support arguments and select and use appropriate written and oral forms to communicate develop historical explanations in a variety of oral, written and electronic forms. Sir Donald George Bradman, AC (August 27, 1908 –February 25, 2001), was an Australian cricketer who is universally regarded as the greatest batsman of all time, and is one of Australia’s most popular sporting heroes. He played his first Test in November 1928. By 1932 he dominated the game, and special bowling tactics, known as fast leg theory or Bodyline, were devised by England to reduce his dominance in a series of international matches in the Australian summer of 1932–1933. Many say that the tactics devised were unsporting and dangerous, but they allowed England to win the series. Bradman joined the armed forces during World War II, and returned to international cricket in 1948, leading ‘The Invincibles’, who went undefeated throughout the tour, a feat unmatched before or since. However, some on the tour did not regard him as a good leader. Over an international career spanning 20 years from 1928 to 1948, Bradman’s batting achievements are unparalleled. Among those who have a meaningful Test match batting average through batting in more than 20 innings, his figure of 99.94 is over 63% higher than that achieved by any other cricketer. Next among those who have batted in more than 20 innings is South African Graeme Pollock with an average of 60.97. After retiring from playing cricket, Bradman continued working as a stockbroker. He also became heavily involved in cricket administration, serving as a selector for the national team for nearly 30 years. In 2000, Bradman was selected by a distinguished panel of experts as one of five Wisden Cricketers of the Century. Each member of the panel selected five cricketers, and Bradman was the only player to be named by all 100 correspondents. The other four cricketers selected for the honour were Sir Garfield Sobers (90 votes), Sir Jack Hobbs (30 votes), Shane Warne (27 votes) and Sir Vivian Richards (25 votes). While Bradman has enjoyed a legendary status among most Australians, a few have raised issues that challenge aspects of his heroic image, including criticism of his sometime divisive captaincy. Why is he considered so special? Why would a museum want a number of his bats, and not just one? What happened in his last innings? Why might that bat be important? Is Sir Donald Bradman a great Australian? Most people would say that he undoubtedly is. But why? How could you justify describing him in this way? * Any controversies and criticisms of him – cricket, business, and personal. Each group reports to the class on its findings. Use all the information gathered to arrive at a conclusion and reasoned assessment of his significance and contributions to Australia. Should he be considered ‘a significant Australian’? Why?